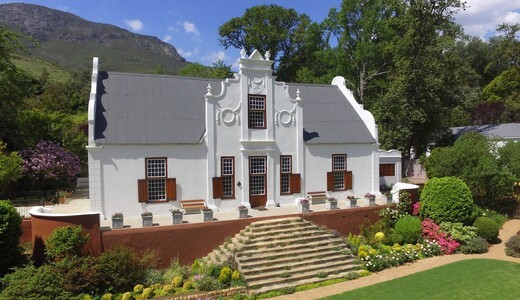 The Manor House is a fine example of the Cape Dutch architectural style exemplified by graceful and well-proportioned tall gables and windows. Old Nectar proudly sports 200 year old, 5 meter ceilings of hand-sawn yellowwood beams and boards, yellowwood floorboards and yellowwood door panels in teak architraves. The yellowwood is an indigenous hardwood tree (Podocarpus longifolia) occurring in the wet forests of the Outeniqua mountain ranges around the towns of George and Knysna. The land on which the Old Nectar manor house, wine cellar and outbuildings are situated was granted to freed slaves in 1692 but the Old Nectar manor house probably had its beginnings in the early 1700’s. The end of Dutch rule and annexation of the Cape by England in 1805 had a material impact on the farming community in and around Cape Town. 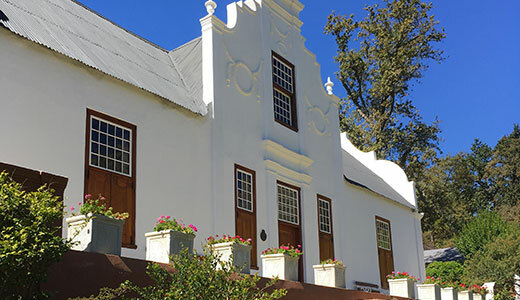 The English government established a large military garrison in Cape Town, giving rise to a greatly expanded demand for port, sherry and brandy, thus bringing a time of plenty to the wine farms, of which Old Nectar was one. The magnificent neoclassical front gable bearing the date 1815. On the younger parts (mid 1800’s) of the Old Nectar manor house the doors and windows are of Cape Georgian style; the original Cape Dutch-style doors and windows were replaced during the time of relative affluence, using imported Oregon pine and Burmese teak. Other than in the kitchen, there were no fireplaces or bathrooms in the original building; these are later additions; the fireplaces in the sitting room and the dining room are thought to be of early 20th century vintage and the bathrooms dating from World War II.